Standing in Oberhausen’s Rathausgrill—an authentic local fast food place that epitomizes the city’s dilapidated, um, charm—for a last currywurst mit pommes before catching my plane out midway through the 62nd edition of the Kurzfilmtage Oberhausen, I use the short waiting time to reflect on the three hectic days preceding it: although I feel I may have seen to much, I also ponder what I may have missed. Presenting 550 films in six days, Oberhausen by definition crushes the usual (and, let’s face it, completely untrue) assertion that your reviewer has seen all the “important” films—be it the obvious A-Fest-competition necessities or sidebar discoveries gleaned via word of mouth and quickly devoured daily reviews, or the alleged “masterpieces,” certified controversy-sparkers, and unexpected “revelations” the buzz creates elsewhere. To clarify: by “hectic” here I do not mean a pressure-cooker atmosphere in the sense of Cannes (the worst example) or many other major festivals, where people rush from one screening to the next, with little time to meet (or think) in between. Oberhausen, one of the oldest and most important short film festivals in the world, is actually quite relaxed and friendly as a place. Cunningly, the festival has avoided over-expansion and remained at just the right size so that people inevitably, but casually, run into each other several times a day around its two or three major meeting points—the small Lichtburg multiplex where almost all of the screenings take place, the hangout spot for nightly parties and food-ticket meals during the day, and the big hotel where most of the accredited guests are accommodated— all of which are within ten minutes walking distance. Were the festival just a tad bigger, you might start to feel lost, especially considering you are part of the horde of short film lovers that annually descends upon what otherwise seems like a ghost town. Since the mid-’90s, the huge CentrO shopping mall has become the “New Centre” of the city, and the old parts of town—like the train-station district where the festival is located—now feels underpopulated, with more shops closing down every year and few local denizens in sight. Only the street in front of the Lichtburg bustles with life in between (well-attended) screenings, both filled by festival guests whose contact with the locals is usually limited to glancing at a few steadfast patrons of next-door places like the rundown pub Alter Hut, or wiggling movements by the incoming film people through the small Oberhausener crowds at the Wine Festival held early May at a square only a few yards away. Strangely, this surrounding feeling of quintessential Ruhrpott tristesse serves ideally as a calming, even serene counterpoint for the turbulence of the festival, whose hectic state springs not from programming, which is spacious—only special-section overlaps occasionally call for tough choices; the competition programs are repeated, and you can catch up with a lot via video-library stints in between—but from the demands of the short form. Festival attendees, and especially film critics, are used to taking in four, five, even six screenings a day, and possibly more with walkouts. But it becomes something else when most of those screenings consist of eight to ten films: regardless of their brevity, the festival phenomenon of details, ideas, possibly entire films bleeding and blending into each other achieves a new dimension. This is especially so in Oberhausen, whose ambiguous richness—which some see as a weakness—comes from a similar blending in their selection: the competition tries to include everything. 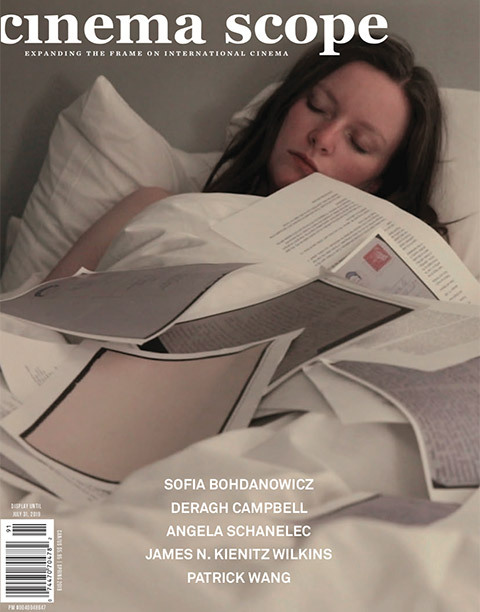 From avant-garde to animation, from all types of (essay-)docs to more or less typical short fictions, from new-technology experiments and video installation-style art-world influx to old-school film-material(ism) outposts. Having attended for more than a decade (though not every edition), this overlap and opposition of art/discourse vs. film/watching fractions, carefully cultivated by the festival, has seemed to me one of its defining elements over the years, in equal measure fertile and frustrating. Of course each festival is, in the end, the sum of its parts, including not just the highlights everyone writes home about, but also the obvious compromises, and even the sell-outs. So Oberhausen’s competition just brings a hidden (or forgotten?) agenda up front, while the emphasis on excess supply of films throws into relief some natural assumptions about how festivals work, as well as ideas of how they should be covered; not once in over a decade have I witnessed speculation among peers who will win the prizes, for instance. Still, another form of practical demands dictates that in the end I leave you with the coverage of my highlights, as usual—but with some interferences, not least because what I can present is only a half-time bet in six segments, and, as I realized during writing, it consists for the most part of combinations not suggested by the festival selection, but rather connecting across different programs. 1) The Day Before the End (Lav Diaz) & Scenes from a Sketchbook (Amit Dutta). 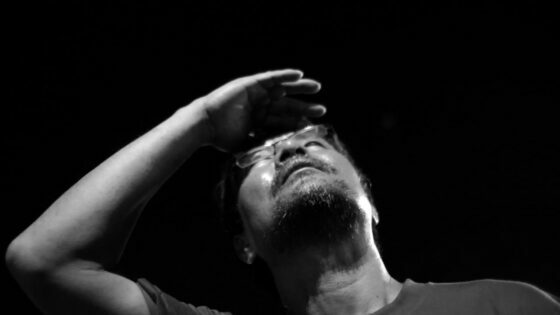 Lav Diaz is still on a roll—has always been, in my opinion, but now he also regularly gets official recognition for it. Thus following his breakthrough Locarno win for From What is Before (2014) and a major Berlinale prize for A Lullaby to the Sorrowful Mystery earlier this year, he scored what is equivalent to second place in Oberhausen with another outstanding achievement. (My half-time did not include Louise Carrin’s top-honored Venusia , so no idea.) Some may be surprised that this certified long-take/long-film specialist succeeds with a 16-minute “miniature,” which reminds of Venice 2007, when the premiere of his nine-hour epic Death in the Land of Encantos was preceded by one of his shorts—not least, as one associate explained to me, “to prove that Lav can not only make long films.” But The Day Before the End simply shows how adroit Diaz’ filmic intelligence is—duration in his long films does not mark dead time, as in a certain strand of festival cinema, but is a deliberate choice to accurately (re)present particular sensual and spiritual experiences. A present-tense science-fiction movie nominally set in 2050, The Day Before the End starts with everyday shots (scenes in a dentist’s office or a small street café), then inserts poetry and catastrophe. A copy of Shakespeare’s Sonnets is seen early on, soon a man rises in the café and starts declaiming choice bits from Hamlet, his fervour seemingly spreading like an infection, picked up by a woman who addresses her countrymen in the marketplace with Mark Antony’s famous Julius Caesar funeral speech … meanwhile, a storm keeps building. Finally, the first drops fall from a black sky, and The Tempest arrives, water flooding the streets, a few lost souls wading knee-, even waist-deep through the tides. Ending on the image of a butterfly—which, an earlier Diaz title told us, have no memories—The Day Before the End manages to reach back to the past and bring it alive for a (future-tense) present surrounded by doom, although resilience remains a possibility, even a necessity, while life and art intersect in images presumably testifying to the silent-era luminosity Diaz miraculously achieves with digital means. I can’t be fully sure, since this was one of the films I screened in the video library during a sweaty session on a hot noon break, horribly hungover (as I was already going to be on a plane when the film was scheduled to screen in the cinema). I also blame my state for my simply forgetting to check out the new short by that other Filipino force, Khavn, scheduled as the very last film to screen in competition. Similarly, I only saw Amit Dutta’s Scenes from a Sketchbook on the small screen, but it was just as spellbinding. Like Diaz, Dutta is taking inspiration from a major historical figure in the arts—18th-century Indian painter Nainsukh, already the subject of Dutta’s eponymous 2010 feature, which this short augments and expands—to craft something mysterious and powerful, utilizing his refined tableau style for a reflexive investigation of art and representation: high (Indian) modernism, rendered in stunning visuals of exquisite sensuality. 2) A Great Way of Life (William E. Jones) & Hubris (Pavel Medvedev). More obvious, but still highly enjoyable and effective, were two works by stalwart Oberhausen presences. William E. Jones combines two kinds of concurrent, quintessentially American found footage—images from Vietnam-era army shorts, and late-’60s commercials on the soundtrack—for an infernal meeting of military-industrial propaganda and consumer culture, whose sarcastic impact is not exactly unexpected, but unfortunately still just as timely. 3) Perlenmeere (Sea of Pearls, Katrina Daschner). Katrina Daschner’s extremely beautiful image poem—mostly silent shots of floating sea creatures alternated with fragmented body close-ups, forming a kind of hybrid body-sculpture—came at the end of the day, and at the very end of the program, with parts of an exhausted audience noticeably worn out by the sounds of silence mischievously combined for the finale of a competition slot that started out nervy and loud. 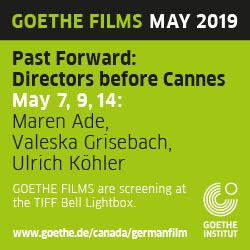 (Daschner’s film was preceded by Rajee Samarasinghe’s assured, but overlong—or was it just the screening situation?—soundless memory-essay If I Were Any Further Away I’d Be Closer to Home.) I had the opposite reaction, being somewhat annoyed at the beginning, even as I did enjoy that Kristin Li’s coming-out culture-mash-up Two Snakes catered to my martial-arts predilections by giving centre stage to a TV version of the oft-filmed classic Madame White Snake (alas, not Tsui Hark’s glorious, misunderstood 1993 version Green Snake), unexpectedly finding an ally the next day in Trailers by susan pui san lok, which samples the many Condor Trilogy adaptations, alternated with digitally enhanced street views in a flashy barrage of cuts. Although the fad for popular Asian cinema has been transferred from the mainstream to the margins in the West, its importance for cultural memory seems beyond dispute. 4) I Think You’re a Little Confused (Ogawa Iku) & Shades of Safflower-dyed celluloid (Oki Kayako). Apart from certain names and strains of festival cinema, a similar neglect of Asia’s still-rich cinematographies plagues the film world in the less popular fields, a fact amply proven by the strong Japanese presences in Oberhausen, which (an insider told me) could have easily been tripled holding the same quality standard, judging from the submissions. Two festival highlights came from names I never heard of. In fact, if somebody had not intrigued me the night before my video library excursion by praising “the Japanese blood sausage movie,” I might never have seen Ogawa Iku’s depressive horror masterpiece I Think You’re a Little Confused, a quite faithful rendering of the Brothers Grimm’s ultra-short and super-weird fairy tale “Die wunderliche Gasterey” (translated into English as “The Strange Feast”), about the scary and ultimately deeply sad encounter of the old friends blood sausage and liver sausage, all rendered in the most endearing animation style; one stark raving mad sausage’s foaming at the mouth would be a joyful sight to behold, were the whole thing not so uncanny. Also worth a mention is Sugar Lump by Okawara Ryo, a popular favourite quickly dubbed The Pink Panda by enchanted festivalgoers; this animated coming-of-age tale mostly keeps the deadpan absurdism coming to amusing effect. But the other Japanese whopper was Oki Kayako’s Shades of Safflower-dyed celluloid, an analog feast for the senses that first shows how safflower is grown, harvested and processed, before applying its seeds and dye directly on the Super 8 material with results that aspire to a yellow-tinted version of a David Gatten film-nature meditation. 5) 489 Years (Hayoun Kwon). Awarded some sidebar prizes, this unsettling and entrancing animation by Hayoun Kwon (born in Seoul, but now living in France) lingers in the mind. The title refers to the time it will take to clear Korea of land mines (official number: more than one million); the soundtrack consists of an interview in which a former soldier remembers a hazardous patrol in the mined DMZ between North and South. This no man’s land is ingeniously brought to life via virtual-game graphics of the first-person-shooter type and smart sound design, using unexpected effects (the shifting POV suddenly reverting to an “impossible” angle) and imaginative details (a three-legged boar—one foot lost to land mines—crossing the soldier’s path) to illustrate the experience of entering a mysterious (un)comfort zone that’s full of natural beauty and manmade death. Coalescing into the surreal image of a flower sprouting on a landmine, the opposites form an inexplicable entity. The same competition program was bookended by two interesting Croatian shorts, with Zagreb Confiential – Imaginary Futures—an urban development study (always a potent theme in urban-development-disaster-example Oberhausen) by Darko Fritz—deserving special mention for unearthing all kinds of historical film footage, including avant-garde pearls, for some impressive montages. 6) Two Profiles: Sun Xun & Josef Dabernig. Owing to circumstances, I only saw half of each profile devoted to these two artists undoubtedly familiar to regular Cinema Scope readers, but immensely enjoyed the opportunity. Though familiar with the work of my fellow Austrian Dabernig, the program I was able to attend consisted of early works, which I hadn’t seen for too long a time—apart from Wisla (1996), one of the few indisputable masterpieces in the challenged field of the football film (augmented by the performance Ticket Content, in which Dabernig and others read the front and back of all his collected football stadium tickets in their original languages: Italian, German, Polish, Spanish, Portuguese, Dutch). Daberning’s beautifully composed, deadpan-melancholy shorts remain one of the touchstones of the last quarter-century in Austrian art cinema, while Sun Xun’s remarkable, allegorical animations gain power from being seen together (previously, I had only encountered some of them individually), not least by demonstrating how his work has grown into something of a collaborative studio endeavour comparable to classical painting practice, resulting in awesome, staggeringly plastic images, as in his apocalyptic 27-minute symphony 21KE (2010). The two profiled artists also shared an exhibition, in which Dabernig’s minimalist individualism (represented by choice stills) contrasted productively with Sun Xun’s newspaper-backed tableaus, attesting to his development from individual artist to studio mastermind. Two outstanding positions, somewhere in between art and film, that talked to each other productively—a success in quintessential Oberhausen style.